The Perth Mint of Australia has issued Gold Kangaroo coins for many years, but 2016 marked the first issue in the Silver Kangaroo series. Struck in .9999 fine silver bullion, this Australian silver coin has garnered truly worldwide demand among bullion buyers and collectors. The coin features an industry-leading purity of .9999 fine silver, a stunning design and an affordable price point below that of the American Silver Eagle. Silver buyers have flocked to the coin for its superb quality and outstanding value. As the third year of issue, the coins will always be considered special items in the coin and bullion marketplace. 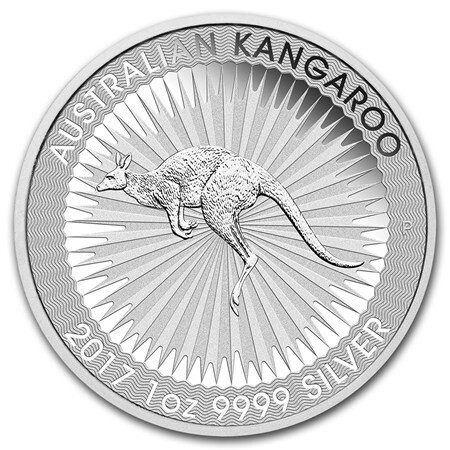 For those who want a beautiful sovereign-minted silver coin at a low premium over spot, the Silver Kangaroo is perhaps the very best product available. Holds 1 troy ounce of .9999 fine silver bullion. Individual silver coins come in protective plastic flips. Orders of 25 come in tubes. Orders of 250 may come in a sealed box depending on our stock. Eligible for physical Silver IRAs. Sovereign coin guaranteed by the Australian government. Legal tender face value of $1 AUD. Arrive in Brilliant Uncirculated (BU) condition. New anti-counterfeit design developed specifically for release on this coin. Features a micro-engraved letter “A” inside the “A” in “Australian,” visible only under intense magnification. This is an official sovereign silver coin guaranteed by the Australian government. You can find also other versions of official Australian minted coins available here. Australia's Perth Mint was the third and final government mint facility opened under the British Royal Mint during Australia's colonial rule under the United Kingdom. The Perth Mint remains the longest operating minting facility in Australia, and it is owned by the state government of Western Australia (not associated with the national Royal Australian Mint). All of the Perth Mint's sovereign coins are considered legal tender under Australia's Currency Act of 1965, including their silver coins. 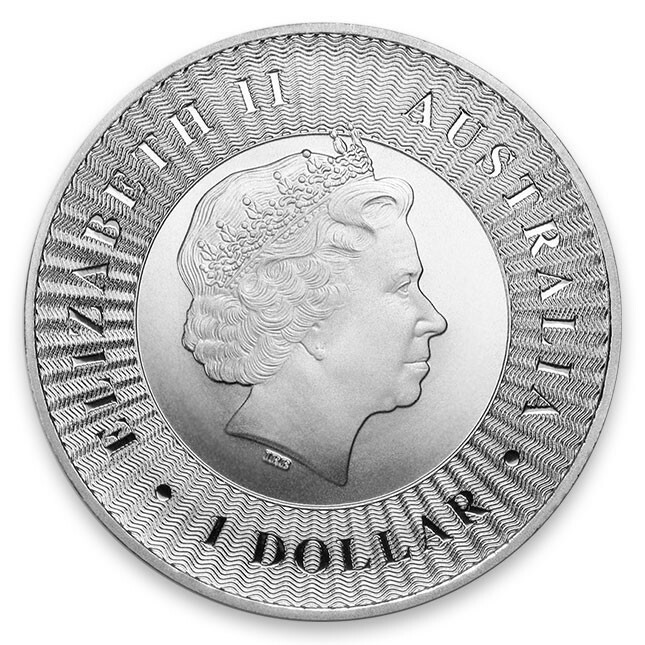 The coin’s obverse bears the likeness of Queen Elizabeth II and the Australian $1 legal tender face value. The reverse of this coin features a red kangaroo design by Dr. Stuart Devlin, surrounded by a radiated design plus a micro-engraved "A" to deter counterfeits. Struck in English, you can also confidently read the coin's guaranteed silver troy ounce weight and fine bullion purity. The Silver Kangaroo coin features a gorgeous state of the art design yet it is offered at a comparatively low sovereign bullion coin premium.